With the newest innovative technology applied, have your home watched anytime especially at night with the Distianert Trail Camera. It has multi-functional controls which makes it a customizable device that will meet the demands of each user. The multi-function controls include time-lapse, interval trigger, multi-shot, recording timing, password protection, and timestamp. It also provides a Quickstart which is best for beginners and learners. 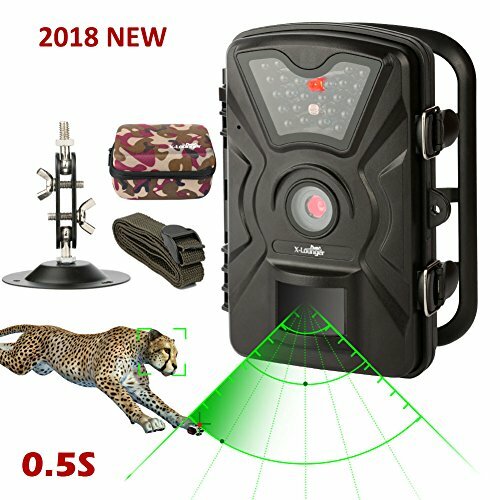 Experts have made Distianert Trail Camera as an enhanced and upgraded device that obtains more impressive and reliable features such as super-fast trigger speed of 0.6 seconds, pre-boot is 0.2 seconds and a 125 degrees detection sensor. With the camera’s multi-shot feature that takes three pictures per detection, you will never miss any significant moments you need to document. Also, with the detection range of 80 feet, the user can cover a larger area with lesser time and delay. The camera consists of 42 LED lights with glow black covert 850 nm infrared flash that can range up to 65 feet. With the help of the responsive and sensitive IR sensors, the camera produces transparent black and white pictures at night and 12mp crystal-clear and colorful images during the day. It also provides a 1080p high definition videos with audio. 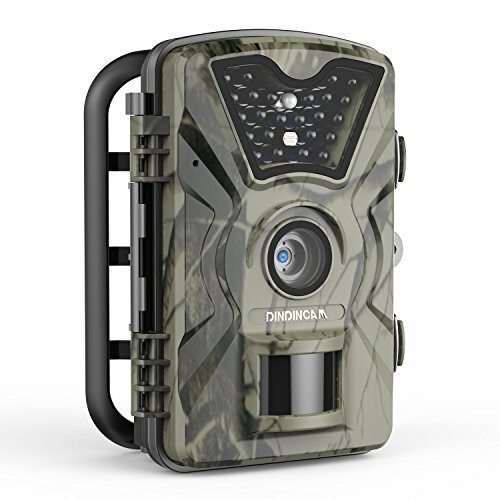 The Distianert Trail Camera allows you preview the settings and data stored on your device through the camera’s built-in LCD 24” screen display. Keep your camera operate capturing up to 30,000 images in one set of 8 new batteries. The camera is powered by 4/8 AA batteries and supports SD card up to 32GB. In addition to all the features, it also has a perfect case with big, sturdy, and comfortable operated latch. It is rugged, waterproof (IP56) and you can leave it outdoors for an extended period. It triggers silently when it detects motion. The battery life may last for four weeks. The device is sensitive enough to detect a movement. The camera’s case is durable. There is a hybrid mode. The camera provides a security password which is optional. A person can detect IR flash. The field of view might be too broad. No plastic tab for easy removal of motion sensor cover. The camera might get fogged up when left outdoors. The sensitivity might not function well especially with small subjects. This IP66 waterproof wildlife and surveillance camera is made with PIR or Passive Infrared sensor which can detect sudden changes in the ambient temperature within an evaluation area. The camera senses motions and can capture still images and record videos at certain times. Aside from capturing still images, other functions include a self-timer, continuous shooting, and many more. The unique sensor design of the camera offers a more great angle of detection. It has a detection angle of 90 degrees, a quick shutter release time of 0.5 seconds, and the trigger distance of 20 meters. The camera consists 24 pcs LEDs for night shots with the passive 940nm IR flashlight that reaches up to 12 meters. It produces sharp, clear and colored pictures during the day and clear black and white pictures at night. It has 12 MP photo resolution and video resolutions that varies from 1920 x 1080P, 1280x 720P, and 848 x 480P. TCO3 Trail Game Camera can be used at extreme temperatures of between -20 degrees Celsius to 60 degrees Celsius. It has extremely low power consumption in standby operation for long operating time. It is powered by 8 AA batteries and can last long for six months. It also alarms in case of low battery level. It supports password protection and is lockable and therefore prevents theft and unauthorized usage. In addition to the highlighted features, this camera is easy to operate. It includes straps that allow the quick assembly and alignment of the camera. Locations can also be encoded on the photos. Using the serial number function allows easier identification of locations when viewing photos, especially if several cameras are being used. Other than the area, the date, time, temperature, and the moon phase can also be stamped on the images or videos. The camera is lockable. It has password protection. The Hybrid mode is available. Not just for trailing but for home security. The camera operates just fine in the cold weather. There is no consistent pick up of motion. The camera might shut down in 5 seconds after setting up. It also might not be worth it using at night. Be guarded with the Bestok Trail Camera for this functions also as an autonomic surveillance device for everybody’s security needs. Collect pieces of evidence through recording and guarding possible unexpected intrusions to homes, schools, warehouses, offices, forests, work sites, etc. The device has a 120-degree wide angle lens, and its monitoring range is much larger than those non-wide-angle cameras. It responses accurately with the trigger time of 0.85 seconds. The trigger interval is 5 seconds to 60 minutes which is adjustable. It can be triggered by a sudden change of ambient temperature caused by motions in the region of interest. The movements are detected by a highly sensitive Passive Infrared or PIR sensor that produces to capture pictures and record videos automatically. The photos taken during the day are colorful, while at night, the images are black and white. The IR LED flashlight reaches up to 65 feet or 20 meters. Bestok M660 is IP56 waterproof and can operate in the ultra-low temperature environment between -22 degrees Celsius and 70 degrees Celsius. 6 or 12 AA batteries power the standby time of up to 9 months. For this camera, you can set the functions into “camera,” “video,” or “camera+video or Hybrid,” and many other modes. It supports photo information stamp also. The camera produces 12 MP photos and 1280 x 720P video resolution. It can playback zoom in for 1 to 8 times and can set the time lapse mode from 1 second ~ 24 hours. Other than these mentioned features, Bestok also offers other excellent features such as the 4-digit number password setting. It supports 8MB~32GB SD Card and WiFi SD Card. It has 14 operating languages where you can choose from. And lastly, a timer is available. The camera is provided with LCD screen display. It has an excellent camouflage color. The camera might be hard to operate. The memory card is on the inside wall. Might experience difficulty. The Victure camera offers excellent features that meet the demands of each user. One of those is the multi-recording modes such as interval recording, time-lapse, timer, password protection, time stamp and low battery alarm. It is password protected and therefore could no longer be useful if stolen and cannot be used by any authorized person. You could set it for time-lapse recording especially if you wanted to capture breathtaking sceneries elsewhere. You always have the choice of whether putting on or not the information stamp on your pictures and videos. The information includes the time, date, moon phase, and temperature. You could put these all or just a few of it. There is also a low battery indicator that warns you about the dying life of the camera’s batteries. This small battery indicator gives you time to prepare another set of batteries and not disrupt the recording. The camera captures 12MP of crystal bright, colorful images and 1080P videos. Photos taken are brightly colored during the day, and it captures black and white at night. Each detected movement will be caught in real time with the camera’s 0.5S lightning trigger time. There is an approximate of 1M to 10M is the optimum placement of the trail camera from the subject. 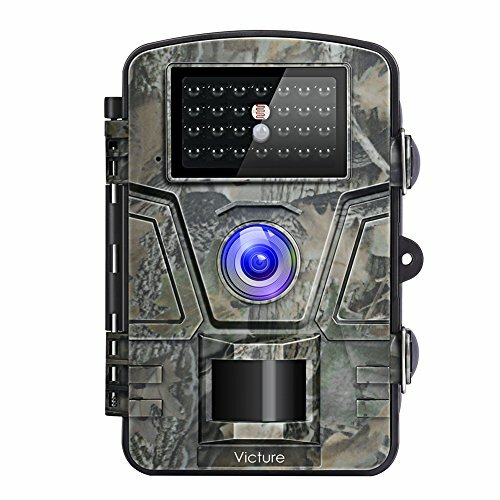 Victure Trail Camera features its dimmed LEDs and Infrared Technology. It has a fully automatic IR filter and 24 pcs 940nm Infrared low glow black LEDs. Also, this device is an IP66 waterproof device, and it is dust-proof, drop-proof, and rain-proof. Also, the camera has a 2.4″ LCD screen that allows the user to review pictures that were taken and videos recorded more clearly, on the spot. 8 AA batteries power the Victure Trail Camera, and there is an approximate of 6 months standby time. The camera is IP66 waterproof. This camera delivers in all categories of purpose. It gives clear and focused photos of humans and animals. It guarantees 12 months warranty. You can use either the batteries or plug it via a power cord. The camouflage color might not fit the color of your wall. Enjoy the Browning’s remarkable high-end performance through the Browning Strike Force HD 850. Experts have developed a custom tuned daytime and night camera lens to produce razor-sharp daytime and nighttime images. This is ideal for security purposes for it provides crystal clear images both day and night. The product features a lightning fast 0.4-second trigger speed and has .8 seconds recovery time. The camera’s quick response guarantees to have every valuable action captured. It includes an 80 ft. Motion detection range and during the night, the camera produces an IR LED flashlight that reaches up to 120 ft. The speed features include up to 8 multi-shots images and up to 8 rapid-fire photos. The Strike Force HD 850 also has a compact size and records videos with sound at 1280 x 720P video resolution. It captures 16 MP images, and it is time lapse capable. It supports up to 512 GB SDXC memory card. It also offers SD Card Memory Management Option. Other than that, the device is powered by 6 AA batteries. 12V external power jack can also power it. 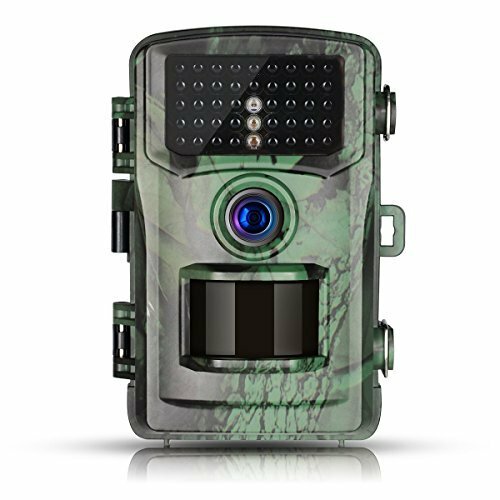 The camera has smart IR Video Detection System; Camo finished and includes data strip on pictures and videos. You could have the time, date, temperature, moon phase, and camera ID stamped on your photos. The camera’s flash range is excellent. This camera produces a red light every time it shoots. The menu system might be very confusing. Keep this camera watching on your properties for its robust features, and robust performance makes it qualified for home and yard security. 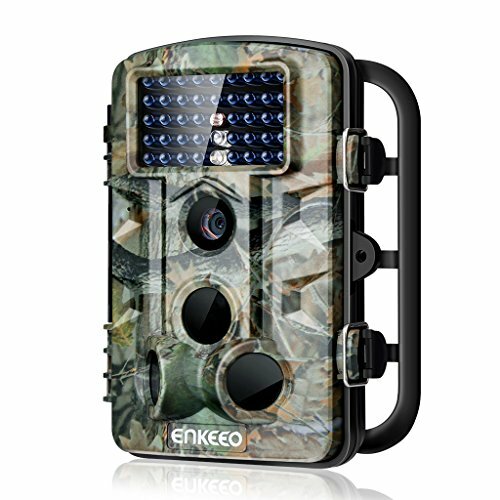 ENKEEO PH730S is equipped with an infrared sensor which offers 120 degrees wide detection angle. It has a quick response time of 0.2-0.6S, has a 6V or 1.5A DC port and, can work with 4-8 AA batteries. The device offers a time-lapse function that allows you to set the camera to capture a picture or video clips at specified time intervals. It provides two modes of time lapse that supports photo, video, and photo + video. The 42 pcs 850nm black low glow IR LEDs captures clear black and white images at night from 65 feet or 20 meters distance. The camera switches automatically between infrared and regular colorful pictures depending on whether it is day or night. Please take note that you using a cloth to wipe up the camera lens is not advisable for it only causes scratches. Rinse the lens and sensor with clean water. Also, the camera has considerable settings wherein you can choose from 12 different languages. It supports four-digit password protection. For product specifications, ENKEOO PH730S has ½.5 inches CMOS sensor and captures 12MP high-quality full-color image resolution. It has TFT LCD screen that is 48 x 35.69mm that also allows you to playback footage and preview photos. You could record 1920 x 1080P HD video for up to 3 seconds to 10 minutes. 5 seconds is the default but shorter than 20 seconds is recommended. The device is IP54 waterproof, and it supports 32 GB SD card. PH730S is certified protected from the rain, sand, dust or corrosion. It can work well in extreme temperatures, and it is effortless to set up. It has a high trigger speed. It can work without batteries. It has 6V/ 1.5A DC port. The red glow is visible at night. Has a slow shutter speed at night. Photo quality is not that impressive. It might also be difficult to use. Be satisfied with the excellent features of THZY – a trail, wildlife monitoring and surveillance camera. THZY offers multiple usages such as home security, wildlife monitoring, and scouting game. It features a 2.0” TFT-LCD screen wherein you can playback footages and preview images on the spot. It supports 32 GB SD card with wall mount and tree strap and carry box. The camera also offers various function modes that fit your needs. May it is for time-lapse, or camera plus video mode, etc. The camera has a perfect detection and flash range of 120 degrees per 20 meters or 65 feet. It is equipped with 38 pieces 940nm black low glow IR LEDs for nighttime operation. IR is fully automatic, and the detection range ensures to capture every action you wanted to track. It has a quick response time of 0.5S trigger speed and it the camera produces 16MP full high definition color pictures and 1080P HD video resolution. It takes up to 3 photos or videos per triggered motion. The camera record videos with sound from 10 seconds to 5 minutes. Storage format for pictures is JPEG and AVI for videos. THZY grants you the excellent images with superb contrast and clarity down to every detail of everything around your property or elsewhere during the day. It takes clear black and white pictures at night. For product specifications, the camera has dual PIR or Passive Infrared sensors. The image sensor is CMOS 5.0MP. It is waterproof and dustproof for better use outdoors, and it supports dual power supply. It can work under the temperatures of -15 degrees Celsius to 60 degrees Celsius It is powered with 4 to 8 AA batteries, and it works on DC 6V. The camera is solidly built. The menu is easy and intuitive and has lots of useful features. It produces quality pictures and videos. The sensor is susceptible which is good it captures every motion. The night vision is clear. THZY is only capable of catching a moving object about once as it is near leaving the picture in the three picture series. The trigger response is prolonged. Each time the SD card is removed to transfer the pictures, the counter is reset. That will leave the user with numerous multiple photographs or videos with the same name. The camouflage color is more of a brighter yellow and is very obvious. X-Lounger game camera is suitable for wildlife monitoring, hunting, and farm and home security. It is made of plastic material from the USA. It supports Wifi + SD Card and SD SDHC card up to 32 GB. You have a lot of options as to what function you would like to operate. You can choose from a photo, video, video + photo, time lapse, interval recording, burst photo (3 photos), or timing. You also have the choice of putting necessary information on your photos. You could use the information stamp and have the time, date, temperature, and moon phase stamped on your photos. The camera is IP66 waterproof and can work under the working temperatures from -20 degrees Celsius to 60 degrees Celsius. It is powered by 8 AA batteries and could last long or standby for 3-6 months. Other than the batteries, you could supply power to the device by external power and plug into the 6V DC connection. With the 2.4 inches screen, you could playback your footage and preview images directly. You don’t need to wait to go home, remove SD cards or connect it to a laptop or a desktop for reviewing. You can record videos with sound from 1-60 seconds, 3 minutes, 5 minutes, and 10 minutes with a 1080P video resolution. X-Lounger game camera has 0.5 seconds trigger speed and a wide detection angle of 90 degrees. The detection range could reach up to 85feet during the day and 66 feet at night. The detection range and trigger speed captures any motion rapidly every time there is movement, you will never miss a thing. The camera is equipped with 940nm black low glow IR LEDs as the flashlight. It has a great picture and video quality. Ideal for property security and surveillance purposes. The camera is straightforward to operate. It blends in so well with the surroundings and is not disruptive to wildlife. It is waterproof and can work under different weather conditions. The camera cannot detect through a glass. If you want three photos every time, then you have to choose fewer quality photos. Every time you hit the menu button, it might just restart. It seems like it’s beyond the return window. The batteries might don’t last for long. 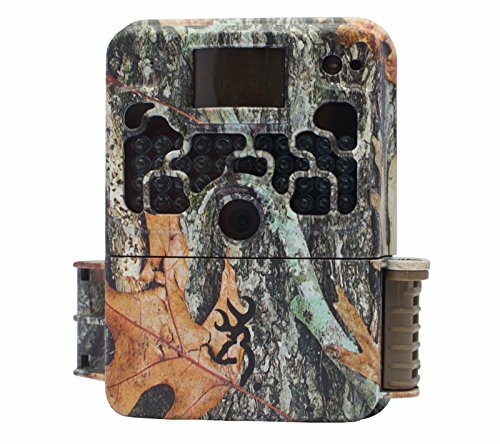 Tougard Trail Game Camera ensures durability as shown in its case design. It has a latch that is big, sturdy, and easy to operate. It is stable, and it can be left outdoors for extended periods of time for it is waterproof. Supply the camera with power form 8 1.5V AA batteries, insert a micro SD CARD, switch it ON and let it standby for eight months. 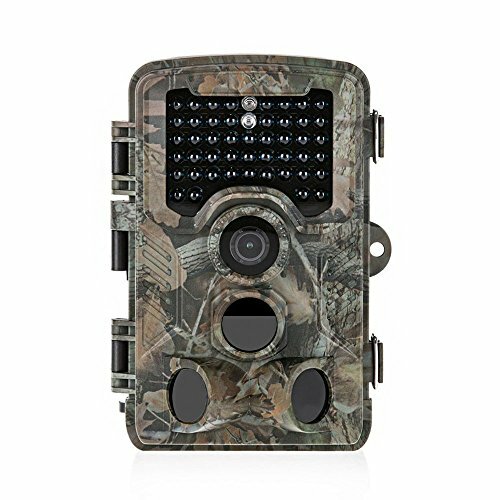 The trail camera is equipped with 120 degrees motion detection sensor and a 100 degrees lens view angle. It also has 42 pcs infrared LEDs which makes it a stealth unit. At night, it makes up to 65 feet or 20 meters detection capturing range. It has a super-fast trigger speed of 0.8 seconds. There is a one-second delay between triggers and you are guaranteed never to miss any of the significant actions you might want to collect. You also have the option to put or not the date, time, moon phase, or temperature stamp on your photos and videos. 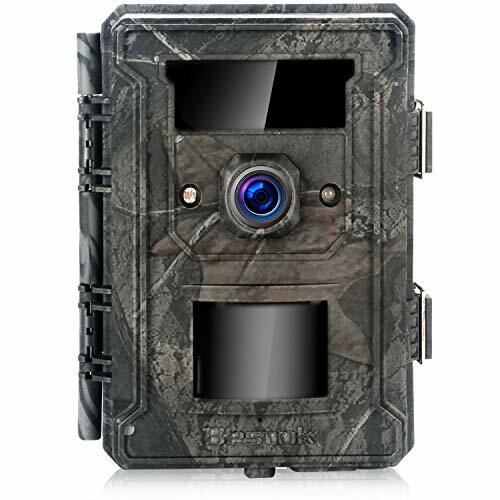 Tougard Trail Game Camera produces 12 MP HD photos and 1080P full high definition high-quality video recording. Photos taken during the day are crystal clear and colorful and black and white at night. Pictures and videos can be previewed directly and conveniently through the 2.4inches LCD screen display. You can record videos from 1 to 60 seconds or 1 to 10 minutes. You could also set the motion sensor sensitivity into high, normal, or low. Please take note that it is recommended to format the memory card in the camera menu when using for the first time. Removing the plastic protective film from the camera lens is advisable. It is for not affecting the camera effect. And lastly, please do not insert or take out the Micro SD card when the camera is ON. The product has 12 months warranty. The quality of videos and photos is best for security purposes. You can delete and view files directly on the cam. It is durable working under different weather conditions. Compact design. You can comfortably hold it in your palm. The size might be tiny for you. The camera produces a loud jingle when changing mode. The battery case is sturdy to open. The unit you get might malfunction. 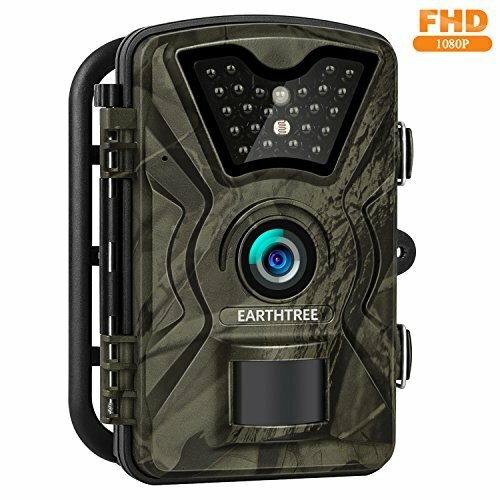 Earthree Trail Game camera takes high performance as a wildlife monitoring and surveillance device. It provides 12MP images and full high definition 1080 crisp videos with clear sound. Photos taken during daytime are brightly color while its black and white if taken at night. Experts designed this camera as a device that can work under diversified working environment. It is IP66 waterproof and can operate from -20 degrees Celsius to 60 degrees Celsius. The design makes the camera able to work in tough environments such as desert or tropical rainforest. The camera is powered by 8 pcs AA batteries with the standby life ranging from 3 months to 6 months. Earthtree as a new scouting camera applies the latest Infrared Technology. It features its built-in 950nm invisible infrared black LEDs. As the night falls, the IR LED turns on automatically and will take super bright black and white photos. Also, the IR flash brings this hunting and security camera an excellent trigger scope. People and animals that are 20m or 65ft away from the camera could be captured. 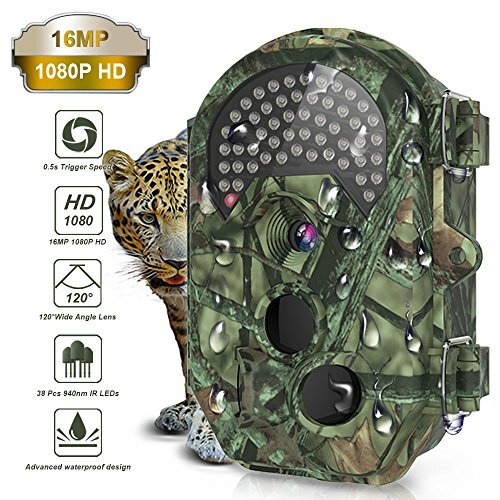 Plus, the unique technology of low glow infrared helps the hunting and security camera cover correctly. The camera has a Passive Infrared sensor with an impressive trigger speed of 0.5S. Each detected motion will be captured in real time, and with the fast shutter speed, you are guaranteed to get every shot. The camera has multi-recording modes which bring versatile applications to this camera. Earthtree supports Password Protection wherein you can lock your device and makes it not useful anymore if ever it will be stolen. Also, it has a Time Stamp option. Lastly, it features the Low Battery Alarm that gives you an indication that your batteries are running out of life. It has an almost invisible low infrared black LED light. The camera will not make any sound when capturing. The photo and video quality are excellent. The camera has the size of a block of sliced cheese. It is made of plastic but feels very sturdy. All the controls are inside case which keeps them waterproof. This camera is excellent for a variety of purposes. It should be avoided from extreme hot and cold environments. It’s a hassle taking the card in/out for checking. It has a small area of night vision, so it’s hard to position.